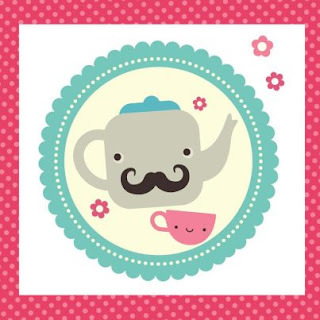 Leo and I were invited along to the Great Cosatto Cuppa on Wednesday, and with such an amazing invitation to see all of their exciting products, while getting the chance to have a look around there show room, it was an event I could not miss. 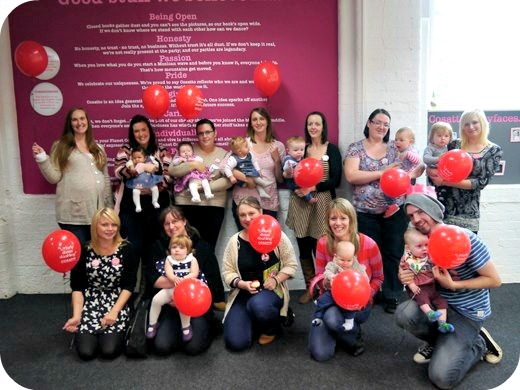 The Great Cosatto Cuppa is a very special coffee morning for parents and their children to go along and see all of the new products such as the Giggle Travel System! Cosatto host these coveted mornings every couple of months and now that word is getting out about them they are becoming increasingly popular. If you are interested in attending the next one keep an eye out on their Facebook page. They announce the next Cosatto Cuppa dates directly to their Facebook fans, and pick a number of their lucky fans to attend. So with the big day finally here, I was up before the sun had even put his hat on (not to mention that it rained most of the day!). My alarm sounded at 4:30am so I could prepare Leo and I for our 6:00am train to Bolton where Cosatto towers are based. Leo blinked the sleep away from his eyes and was luckily in a very bubbly mood as we set off for a very colourful day out. Upon arrival we were greeted by the lovely Cosatto ladies and offered very much welcomed refreshments before being taken to sit down. Leo was over the moon to be presented with a biscuit and almost squealed with excitement when he saw the very yummy looking cup cakes. He almost bit my hand off when I offered to share one with him, and wasted no time at all in devouring the cake. It was lovely to see such a great turn out, with a mass array of babies of all ages. There were teeny tiny newborns, curious 6 month olds and troublesome toddlers (insert Leo’s name here…) but regardless of the children’s ages there was one thing that we all had in common. The owner of Cosatto gave everyone a very warm welcome and explained that as he no longer uses the products every day as his children have now got that little bit older, it is great to hear feedback from families who are actually using the brand and who can give real constructive feedback. This just shows that Cosatto are still pushing forward and wanting to improve their products further, and it us parent’s who can provide this valuable information. As a bit of an ice breaker we each took it in turns to introduce ourselves, and of course our little ones, before trying to think up 3 words that best described the Cosatto brand. Of course the first thing that comes to my mind is ‘Fun’ and ‘colourful’ but finally I think that it is ‘exciting’. It was interesting to hear how everyone felt about the Cosatto brand and one lady even used her three words to say ‘Must. Have. Brand’. Cosatto have just announced their very first ambassador programme and I am very excited to be taking part in this over the next 6 months. With a few other members of the programme also in attendance, they took the moment to introduce us all to the rest of the group as their ambassadors and to also crown us! Leo was looking at me with curiosity in his eyes, wondering what on earth was on my head, obviously thinking how silly his Mummy was looking. 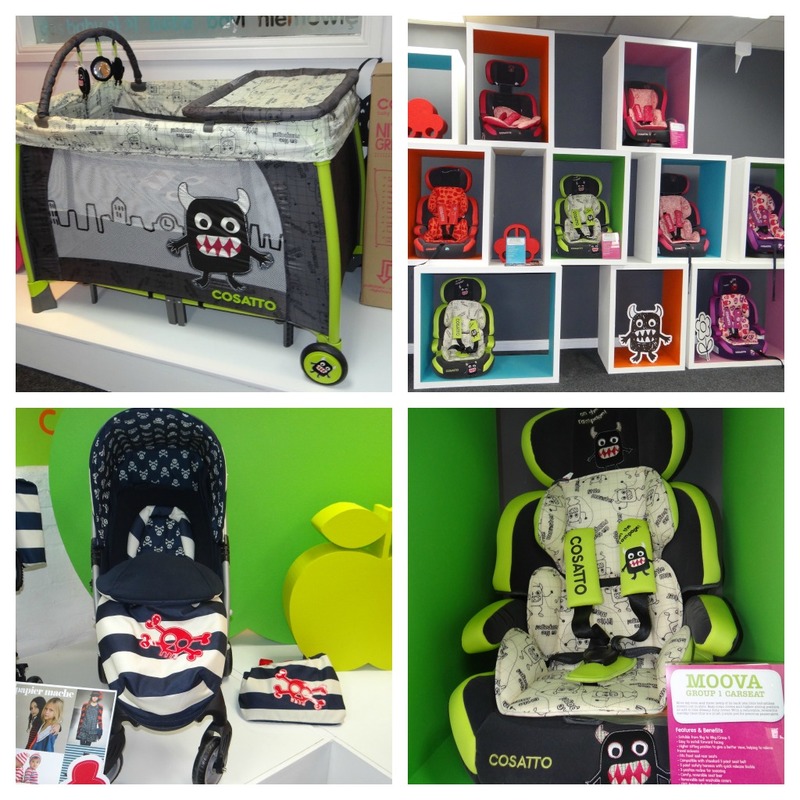 The Cosatto Show room is just fantastic and they have all of their pushchairs, car seats and furniture range on display. It is so easy to walk around making a mental note of everything that you want and somehow…need! I had no idea that Cosatto did nursery furniture. Did you? I can tell you now though that it is all beautiful. 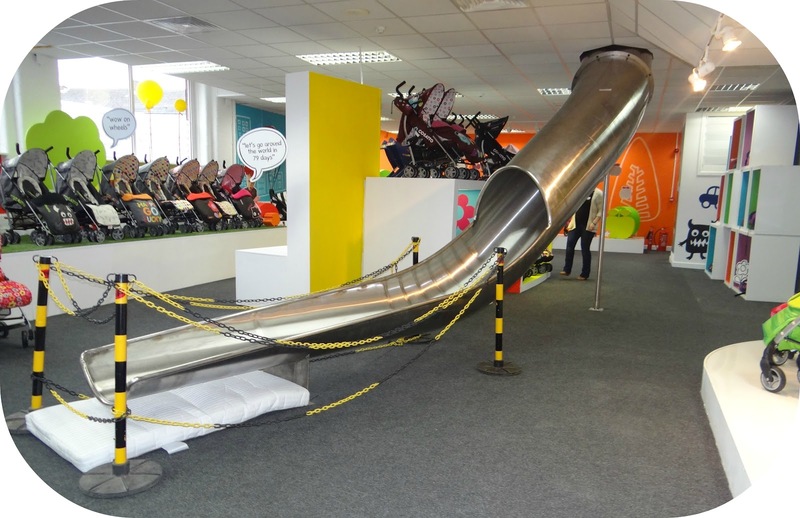 One thing that caught everybody’s eye was the incredibly big slide that protruded out of the ceiling. This slide is for office members to use if they feel like by-passing the stairs for any reason! I think this tells you instantly what a fun place Cosatto head quarters is and I think this reflects the fun factor in the product designs, I mean how could it not? The slide was out of use to us for health and safety reasons but we all stood and admired the very impressive slide none the less. It was blocked off to avoid anyone attempting to steal a go, but this obstruction just made Leo even more curious and given half the chance I know he would have been climbing it. Leo was a little monster all morning, running around and onto the stages with all of the displays. One of the stages was right next to the table housing all of the very delicious cup cakes, and it did not take Leo long to reach up a hand to try and take one for his own. We were given a product demonstration on the Giggle Travel System, and shown how small it folds. In comparison to my travel system this was really compact and would very easily fit in the boot of my Peugeot 206. 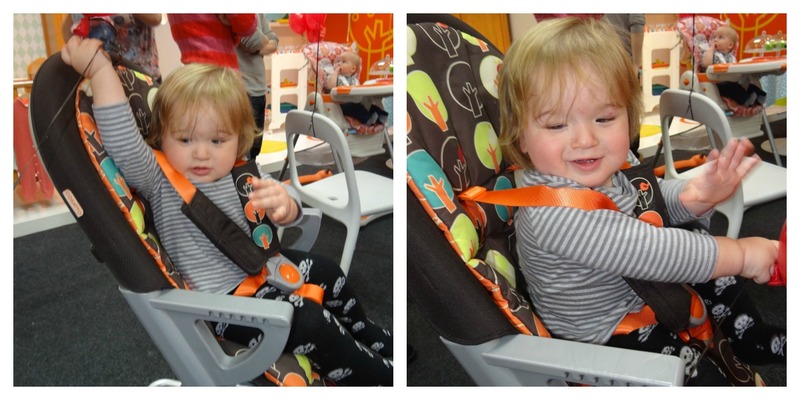 We were even lucky enough to be shown a new highchair that is in development for next years range. As it is still in the development process it means that all of the feed back that was provided yesterday from the parent’s can be taken into account before the final product is put forward to the customer. I found my morning at Cosatto Towers very informative and enjoyable. I have always loved the look of the Cosatto brand, with their bright colourful patterns and friendly usability but now I feel I know the brand it’s self and what they stand for, and that is providing families with fun filled baby products that scream with personality, with user friendly features at affordable prices. And the affordable prices are what really makes Cosatto… Cosatto! Cosatto offer you complete packages where you can pay one price and get everything you need in one box. Take the Cosatto Pear Drop for instance, for £214.00 (depending where you purchase) you can get your stroller (suitable from newborn), cosytoes and rain cover all in one go. I find this brilliant as it all comes as standard in the box with a 4 year guarantee (Yes 4 years!) and all perfectly matches your stroller. With other brands you do have to buy the cosytoes and sometimes the rain cover at an extra expense to you. Disclaimer: I was provided with a goody bag at this event however all views and opinions are completely honest and my own.